With its nautical stripe print and on-trend wrap silhouette, the Marinere Midi Dress is on of our favourites for the summer! 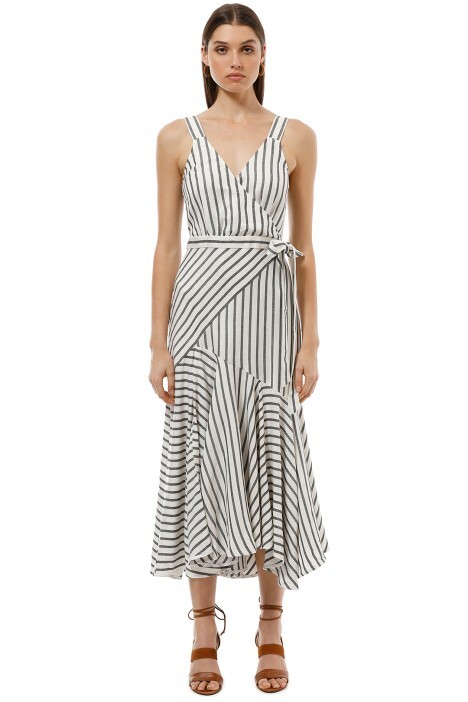 The striped midi dress features a deep V neckline and thick shoulder straps. It has a fixed waist tie and a midi skirt with contrasting stripes and an asymmetric hem. Make it yours by renting it for a summer wedding or for a day at the races. Look effortlessly chic for your next race day by wearing the dress with a pair of lace-up espadrilles and a hired brocade turban headband. Read our blog post for makeup looks to try for race day!